Emerald Health’s focus is centered on the unique needs of every practice. With expertise in every medical specialty our mission is for your practice to have steady and reliable billing revenue by taking the work and stress of billing off your hands, and letting a team of industry leading professionals take care of it for you. Our staff will ensure your claims achieve the highest first pass rate possible, that each claim is manually checked before submission, and that every single denied claim is followed up on. Making the switch is easy, and a dedicated team will be with you every step of the way as you increase your practice’s efficiency and collections. By streamlining your billing process with Emerald Health you and your staff would be better able to focus on good patient outcomes rather than back office work. 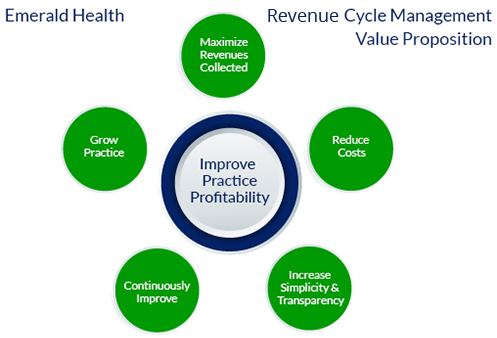 Our goal is that your practice is as profitable and efficient as possible. Why use Emerald Health for Your Medical Billing?